Can A Nation $20 Trillion In Debt Afford Higher Interest Rates & Will This Change Our Retirements? For a retirement investor who is currently earning a 1% interest rate, a 5% increase in rates to a 6% return would increase their total investment earnings by 1,263% over 30 years, allowing for a radical improvement to their eventual retirement standard of living. And for a current retiree who is drawing down their investment portfolio over 20 years, a 5% increase in annual interest rates from 1% to 6% would allow them to raise their standard of living by a full 57% in each and every one of those years. 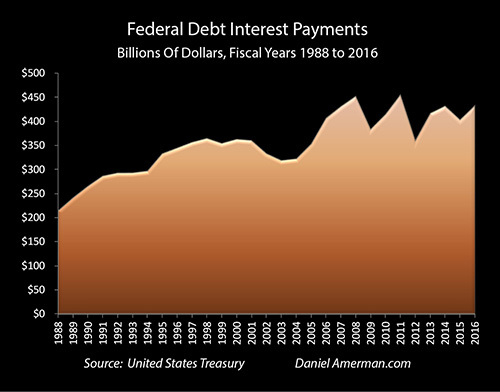 Because the government borrows the money to make interest payments, this could set off a chain reaction of paying interest on money borrowed to pay interest, leading to a national debt increase of the current $20 trillion up to $96 trillion in 20 years. So unless there are some huge tax increases, a 5% increase in interest rates would increase the national debt by $76 trillion. To put such a fantastic number in more personal terms, if we divide it by the number of American households with incomes above the poverty line, that means that for each able to pay family, their personal share of the national debt would rise by almost $700,000. So the very same major increase in interest rates that so many millions of savers badly need for their financial security – could simultaneously send the national debt spiraling upwards and out of control. Let me suggest that this relationship creates an extraordinary financial conflict of interest between savers and the government. Many people believe that the enormous national debt is a somewhat theoretical problem for the future. That is, they suspect that it will at some point be a great financial burden for our collective children and grandchildren to deal with, but they don't see a direct impact on people's lives today in any major or practical way. At the same time, they are quite frustrated by the very low interest earnings that could force them to delay retirement, or if they are currently retired, that are already reducing their standard of living. What they fail to see is that record setting national debts and very low interest earnings for savers are not separate issues but rather they're two sides of the same coin. When we understand this essential point, we can see that massive national debts dramatically and directly impacting the lives of many millions of people is not something to anticipate in the distant future, but rather it is happening right now just as it did last year, and just as it will likely happen again next year. With the Federal Reserve repeatedly but slightly increasing interest rates between December of 2015 and December of 2017, many commentators are suggesting that a return to "normal" interest rates is on the way. And if weren't for the near $20 trillion national debt - they just might be right. What the national debt does is place limits on where interest rates can go. Interest rates can go up sharply - but only for a brief period of time. Interest rates can go up for a long period of time - but they can't go very much higher than they are right now, and must (on average) remain exceptionally low from a historical perspective. What interest rates can't do is to both rise sharply and to stay high for a long period of time - not if the financial viability of the United States government is to be maintained. And to see why that is the case, we need to understand the relationship between the national debt, interest rates, and saver and retiree income. 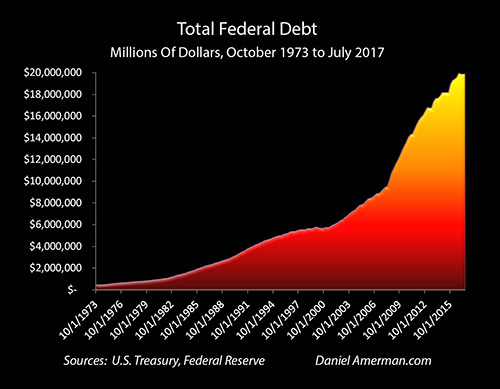 The graph below shows the amount of federal debt outstanding over the last 40 years. 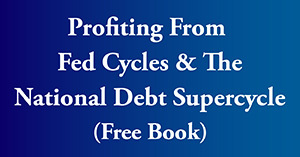 As can easily be seen, the federal debt exploded upwards with the financial crisis of 2008, and began its meteoric ascent to the current $20 trillion dollars outstanding. Now ordinarily if we think about having our debts balloon out of control, we would expect to be making much higher interest payments. That is, all else being equal, if our debt doubles or triples then our interest payments should double or triple. As can be seen in the following graph, however, this hasn't been the case for the US government. To the contrary, interest payments by the federal government have either been falling or level ever since the financial crisis began. 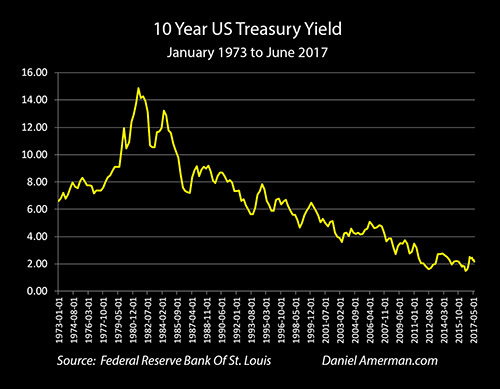 As plainly shown in the graph, the answer is that interest rates have in recent years plunged to their lowest levels in the last 40 years. It should also be noted that even with the highly publicized increases by the Federal Reserve between 2015 and 2017 – interest rates are still far, far below normal. 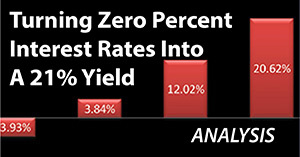 At the very same time, savers and investors have also been experiencing these very low interest rates. Now if someone viewed the federal government's being in debt as being similar to an individual being in debt, they might wonder if this just comes down to extraordinarily good luck. To have interest rates plunging even as the amount of debt outstanding was soaring upwards! And generally speaking, this is where a lot of confusion can occur when trying to understand the debt and the deficit, because indebted national governments that can borrow in their own currencies are nothing whatsoever like individuals or corporations being in debt. In the case of the United States, interest rates have been controlled for some years now through the actions of the Federal Reserve. 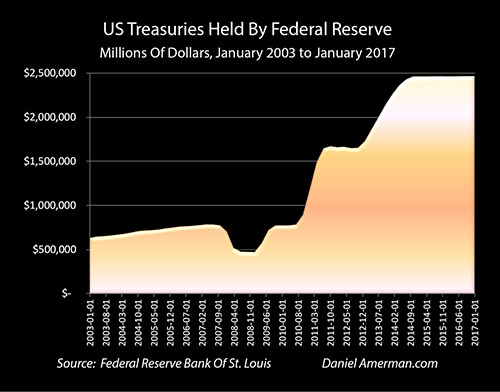 That is, as illustrated in the graph below, at the very same time that the federal deficit has been soaring, the Federal Reserve has been quite literally creating trillions of dollars out of the nothingness and using this brand new money to purchase United States debt – not directly from the US government, but through the markets. How do interest rates impact someone who is pursuing a long term investment program, perhaps to fund a desired retirement lifestyle? 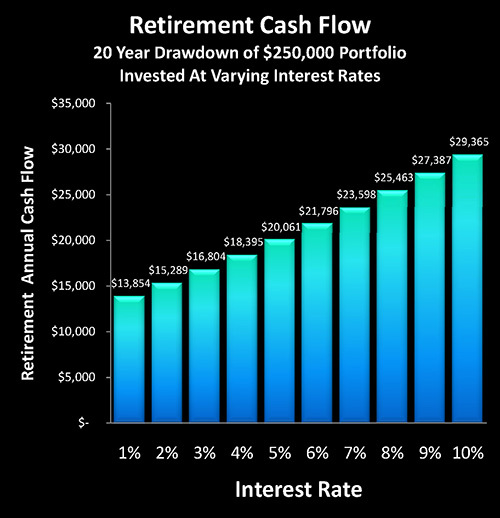 As shown in the above graph, a saver who invests at a 7% rate for 30 years can expect to turn a $10,000 initial investment into a $76,123 investment, meaning their total earnings were $66,123. This is the math that drives conventional long-term investment models – each dollar invested creates another six dollars and more, thus savers who practice long-term discipline are highly rewarded over time. And if the saver were able to get a 10% rate of return, then their earnings would soar to $164,494, with that 3% increase in interest rates leading to a near tripling of investment returns. 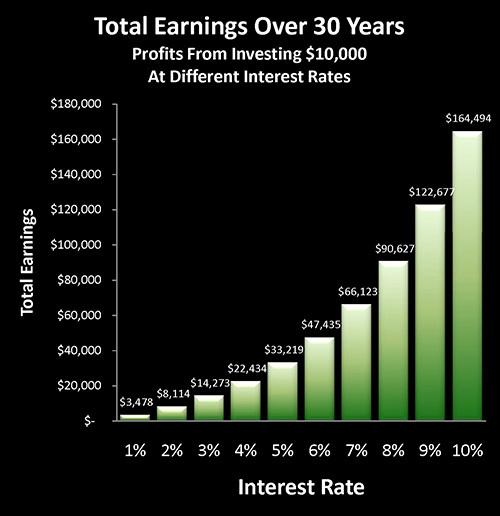 On the other hand, if we drop that interest rate to 1% – then the profits earned over thirty years plummet from $66,123 to $3,478, which is a reduction of 95%. If interest rates turn out to be 2% on average, a saver would fare better with earnings of $8,114, but that is still a reduction of 88%. While little remarked upon or understood, the United States government has an interest rate-related problem of its own when it comes to the debt and the deficit. That is, tax revenues are not sufficient for the federal government to make either principal or interest payments on the federal debt. So each time a principal payment is due – the federal government issues a new debt to get the money to pay off the old debt. And each time an interest payment is due, the federal government issues new debt to make that interest payment. Indeed, borrowing the money to make interest payments is the source of over half of the annual federal deficit. 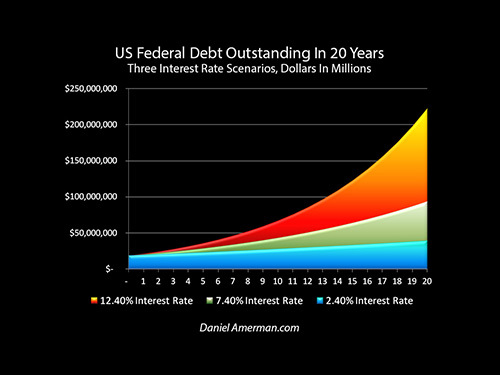 What this means is that the federal government has a compound interest problem, as shown in the graph below. The issue is not just about the interest rate itself going up, but the amount of borrowing that must be entered into to pay those interest payments rises sharply as well. Thus the exact same rising interest rates that would provide what savers need – which is the rapid compounding of investment interest – would simultaneously set off the extraordinary danger of a rapid compounding of debt interest for the federal government. As shown in the graph, and explored in further detail here, a 5% increase in interest payments for the federal government would cause the level of federal debt to rise to $94 trillion over the next 20 years because of the compounding of interest, and a 10% increase in interest rates would cause the federal debt to climb to well over $200 trillion. Now if interest rates were entirely different for savers and investors than they were for the federal government, this problem with the government needing low interest rates on its extraordinary amount of debt would not be an issue for savers and investors. Unfortunately, as we can see, the opposite is true. Whether explicitly stated or not, almost all interest rates are effectively tied to what is known as the risk free rate, which is the government bond rate. In other words, this federal borrowing rate is the base, most other interest rates are effectively tied to that base, and therefore most interest rates tend to rise and fall with the base federal rate. So when interest rates on the federal debt climb, interest rates on deposits, money market funds, bonds and mortgage securities all rise as well. And when interest rates paid by the government on its debt falls, all of these other interest rates usually fall as well. So there is a sharing of interest rates so to speak, where the interest returns received by investors very directly correlate to the interest rates paid by the government. Which again points to the huge conflict of interest between the objectives of savers and the needs of the government. When someone is building wealth by investing over a period of decades, there is another crucially important factor aside from the wealth-building returns, which is the lifestyle that can be afforded once one has actually retired and is drawing down their portfolio. The graph below assumes $250,000 in retirement savings being evenly drawn down over a period of 20 years, with nothing left at the end of the 20 years. Now the higher the interest rate, naturally the more the interest income each year, which allows the principal to be drawn down more slowly. So with higher interest rates, retirees get both higher interest payments and larger average principal balances over time, which can combine to make a surprising amount of the difference. So if we assume a 7% interest rate, as bonds have often returned over the last 40 years, the $250,000 portfolio would produce $23,598 per year in cash available for spending. If we were to increase that rate to 10%, the annual standard of living would be almost $30,000 per year. If on the other hand we were to drop it to 5%, the annual standard of living that could be supported from these investments would fall to $20,061. Now the heart of the issue with very low interest rates is that if someone holds their money in short-term, high-quality investments that pay a 1% interest rate – then specifically because the federal government has suppressed interest rates to keep them down to a mere 1% – the saver's income is only $13,854 per year for those 20 years. At a 2% rate it would be $15,289. While this is little remarked upon, it's the incredibly important heart of the issue. This drastic reduction in interest rates to serve the needs of a heavily indebted federal government may drop retiree incomes by 30-50% for decades relative to what they would be with longer-term average interest rates. So tens of millions of retirement investors who are planning on supporting themselves primarily with their investment portfolios and the rewards of their many decades of disciplined savings may see their lifestyles drastically reduced – specifically because the federal debt outstanding is now approximately 20 trillion dollars. Who Is Really Paying For The Debt? Many well-intentioned older people feel very badly indeed about the massive federal debt which they believe we are leaving for our children and grandchildren to repay. And they are correct in that we are leaving tremendous financial challenges for our children and grandchildren, of which this extraordinary level of federal debt is a key component. There are many other people who don't worry or think about the size of the national debt at all – and who have a strong desire to keep things that way. Yes, they are likely aware that the federal government owes some fantastic, almost surreal amount of money, but it doesn't seem to be affecting their personal daily lives in any way that they can see – so they just choose to ignore it. Unfortunately, both groups of people – who comprise the great majority of the population – could not be more mistaken when it comes to the national debt being primarily a problem for the somewhat distant future. For if we're talking about the value of the federal debt and its repayment in the decades ahead, the debt is actually far more likely to be paid in inflation, or through a combination of inflation and artificially-suppressed interest rates (as explained here), than by our children and grandchildren toiling for decades to slowly repay the debt with dollars that have the same value as today's dollar. Rather than being some far-off burden for our children and grandchildren to bear – the price of the massive amount of federal debt is being paid in the here and the now. Anyone who has a retirement account is paying a price. Anyone who has or is entitled to a pension is paying the price, because that pension may very well be in financial distress now or in the future because it just can't get the interest earnings needed to meet its obligations. Conversely – anyone who uses a loan to buy a car now or in the future is likely to benefit from low rates. As will anyone who takes out a mortgage to buy a house. Particularly for younger people who are still in a borrowing phase and have not yet reached the saving phase of life, the current low interest environment has acted to improve the quality of their lives by reducing what they pay each month in interest payments. In some ways, the current extraordinary level of federal debt could be likened to sharing our solar system with a financial black hole. Just because people aren't seeing it every day – doesn't mean it isn't there. Whether seen or not – the massive gravitational pressure dominates everything around it. And every time someone saves, invests, retires or makes a major purchase – the massive weight of that $20 trillion debt pulling interest rates down through the corresponding governmental interventions impacts their life in some way, right that minute. This "black hole" can be found in other nations around the world as well, for the United States is far from alone when it comes to having huge national debts with a rapidly aging population. While this massive weight affects every part of society, there is one group that is more affected than any other. That group is the people who are following traditional retirement planning or other conventional long-term investment strategies. Traditional financial planning doesn't take massive federal debts into account. Instead, investors are supposed to receive market interest rates that will reward them with a compounding of wealth before retirement, and a generous cash flow after retirement. 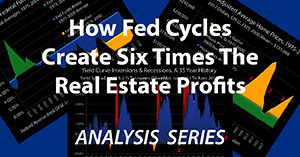 But since the federal government can't afford substantially higher interest rates – it could be a very, very long time before medium and high interest rates return over the long term. Oh, interest rates can go substantially higher for a short period of time, or go a little bit higher for many years, but to pay historically average interest rates over a period of many years would be financially crippling for the United States government. 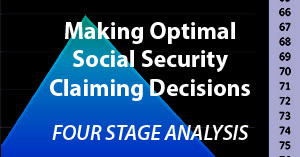 So on average and over the long term - there are limits on where rates can go, and this is particularly true when we also consider the rapidly increasing costs of paying Social Security and Medicare benefits over the coming years, as explored here. Because that is the case – tens of millions of people may never achieve the long term compounding of wealth they were anticipating for retirement, nor the level of cash flow they were counting on after retirement. This doesn't mean that it is impossible to successfully build wealth in low interest rate environments, but rather, it is a matter of assumptions and choices. If an investor starts with the traditional assumption that interest rates will be high enough to support a desired standard of living in retirement, and interest rates turn out in practice to be a fraction of what was assumed – then the natural and expected result is that the actual standard of living experienced in retirement may be much lower than what was planned. On the other hand, if one starts with the opposite assumption that there is a strong chance that rates may remain low for an extended time, then quite different strategies can be chosen for that environment, where the lower that interest rates are, the better the strategies perform. So that the longer the low interest rates continue, the better the long-term investor results, and the higher the resulting standard of living. But before such choices can be made, the necessary first step is to recognize the existence of the problem. Which is, in this case, to understand that a $19 trillion federal debt is neither irrelevant to our personal lives, nor is it just an issue for the distant future – but rather it is influencing and changing each of our lives every day right now, and is likely to continue to do so for many years to come, particularly as the debt grows steadily larger. Our future will include major new retirement and investment challenges. This will be true not just for society, but also for each one of us on a very personal basis. Some people would rather not think about it - and they will therefore likely be surprised by a series of events that could end up defining their day to day lives over many years, when the future does indeed turn out to be quite different from the past. Other people will choose to look reality straight in the eye, and will seek to learn about the personal impact of the coming challenges in advance, even as they search for their personal solutions. The six analyses below were written for those who want the best understanding they can get today of the coming challenges and opportunities which are likely to be faced by each of us as individuals.